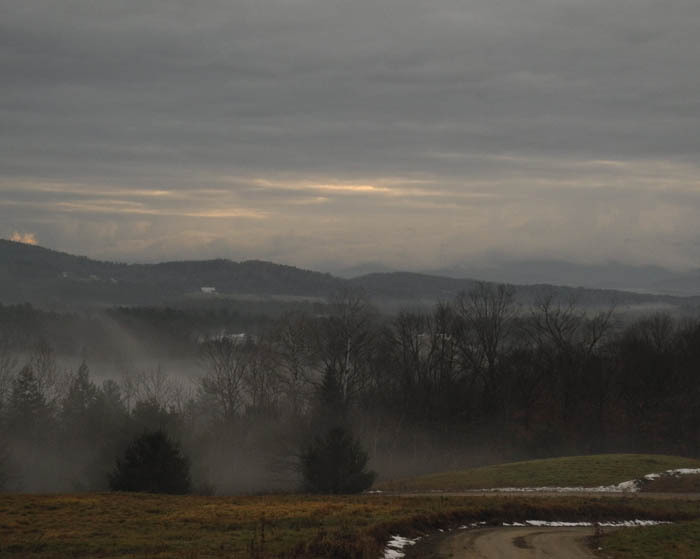 This year, November hasn't been quite like itself; instead of gray, we've had blue skies and mild temperatures. But today I awoke to a perfect November day, with overcast skies and clouds come down to earth in drifting billows of fog. The contrast of dark with white moisture and the lack of sun and shadow heightens the minimal colors left in the landscape. The broad view from my bedroom window shows layers of space: trees overlapping trees, hills fading in distance until the farthest White Mountains are seen, partially hidden by banks of clouds. Only broken edges of snowbanks remaine from last week's snow, after days of mild weather. 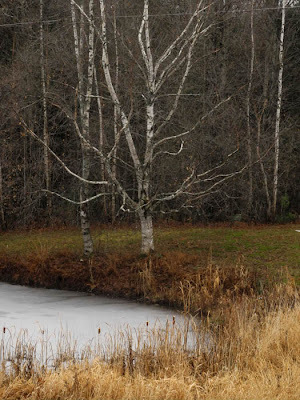 The dried grasses seem brilliantly golden alongside the whites of icy pond and birch. Looking back toward the barn, there is still some rich green in the lawn. 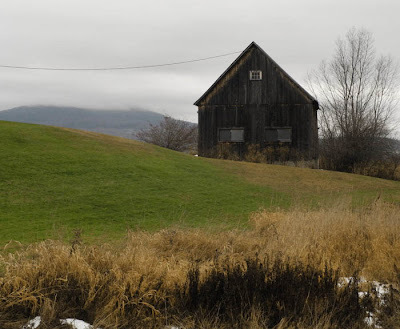 A dark mass of weeds looks somehow vibrant, repeating the shape of barn and tree. In my backyard, the leaves of rugosa roses still hold the colors of rust, shouting them loudly enough for me to enjoy from my office window. 2011 #39, hand dyed wool and egg tempera on linen, 13 x 11 inches. This new group of drawings all have central images, although they relate to the space around them differently. 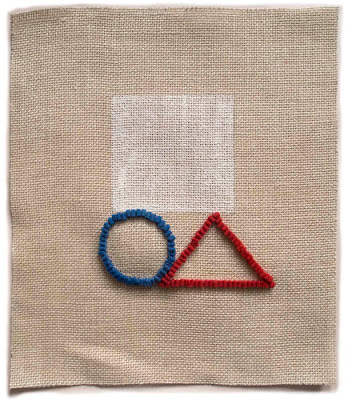 #39 is balanced, a white square held up by the lines of circle and triangle, its color wryly patriotic. 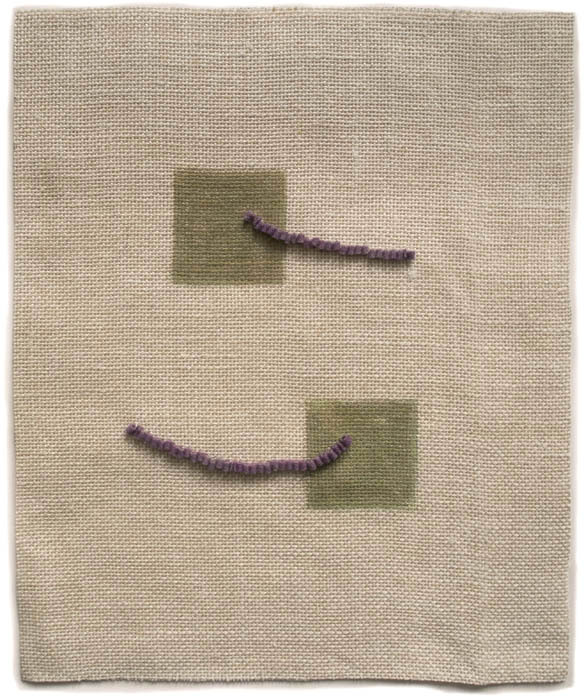 2011 #40, hand dyed wool and egg tempera on linen, 15 x 12 1/2 inches. The swooping purple lines of #40 tickle the space around them, humoring the stolid green squares. 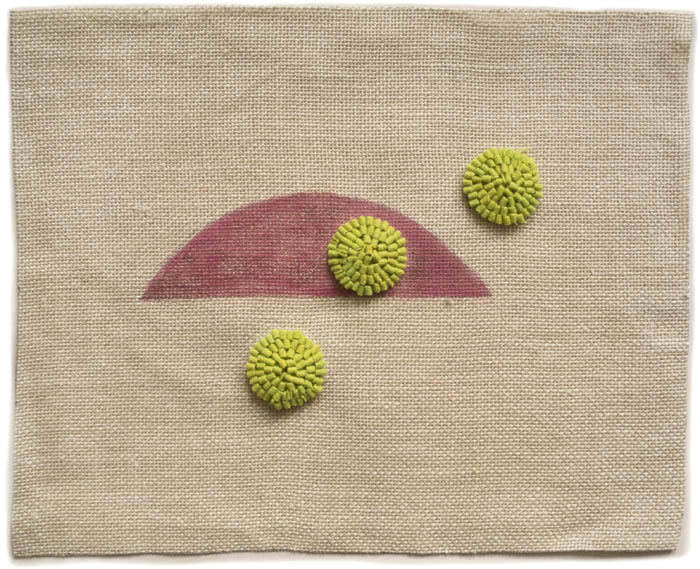 2011 #41, hand dyed wool and egg tempera on linen, 15 x 11 3/4 inches. An open rectangle allows space to enter, as does the deep blue shape. I was inspired to use these colors by a beautiful pastel by Arthur Dove at the Met (unfortunately no good reproductions exist). 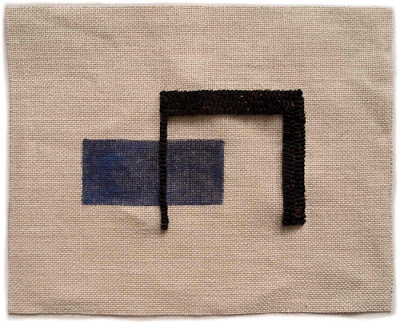 2011 #42, hand dyed wool and egg tempera on linen, 12 1/4 x 15 inches. Lime green circles animate the space as they follow a curved line through a pink semi-circle. The lively colors made me think of old cartoons, like I thought of cartoons in my last group of drawings; then it was Wile E Coyote and Road Runner, now it's the bouncing ball sing-alongs of Betty Boop cartoons. There's something lighthearted in these these works for me; even when the composition is geometric and minimal, the materials seem casual and carefree, the slightly rumpled linen ready to float breezily away. .
Bowl with Green Splashes; Iraq, 9th century; earthenware, splash painted on opaque white glaze. Walking through the new wing at the Met, officially titled "New Galleries for the Art of the Arab Lands, Turkey, Iran, Central Asia, and Later South Asia" is as overwhelming an experience as the name sounds. I arrived at the entrance to the galleries feeling full of excitement after weeks of beautiful teases. 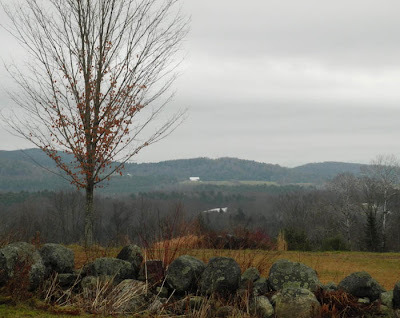 I had my camera out, ready to start photographing, but there was too too much to look at and too many beautiful objects to think of singling any one of them out. 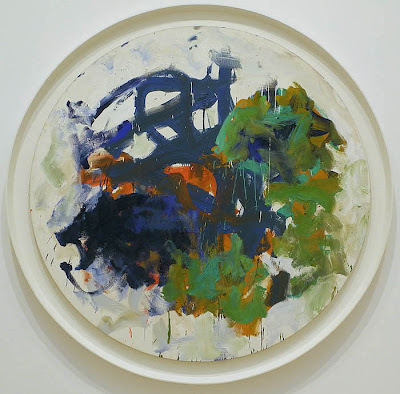 So I walked slowly through the galleries, trying to absorb some of what I saw – architectural elements, pottery, textiles, paintings, metalwork – all bright and fresh and demanding attention. 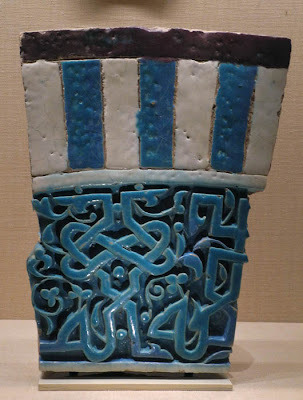 Then I decided that for this visit I would concentrate on photographing ceramics, which are some of my favorite objects at the Met, and on metalwork (for a second blog post), which I found very compelling in their shape and intricate design. 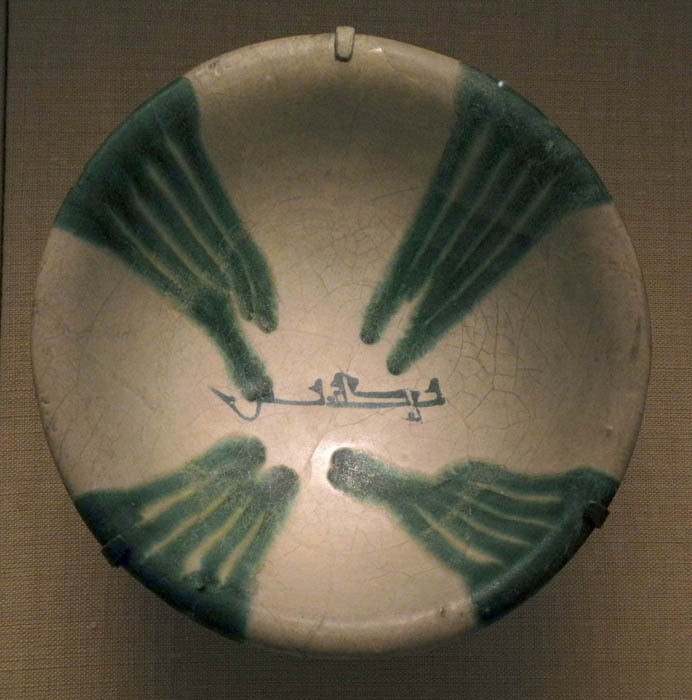 I love the very simple, modern looking, design of the ancient bowl above, with wide green lines dripping from its edge toward the central calligraphy, which states "Blessing and good fortune". 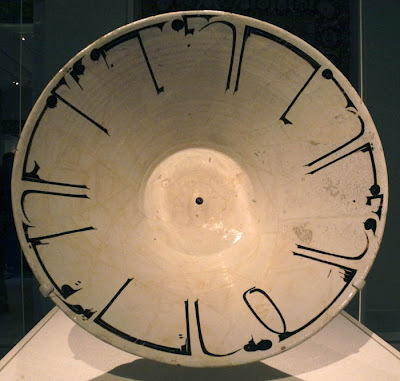 Bowl with Arabic Inscription; Iran, 10th century; earthenware, white slip with black slip decoration under transparent glaze. The elegantly footed lines reaching into the center of this bowl descend from lines drawn about the top, pattern so abstract that it is difficult to see as language. I wonder how this appears to a reader of Arabic: do they see the words or the design first? The words say "Planning before work protects you from regret; prosperity and peace." 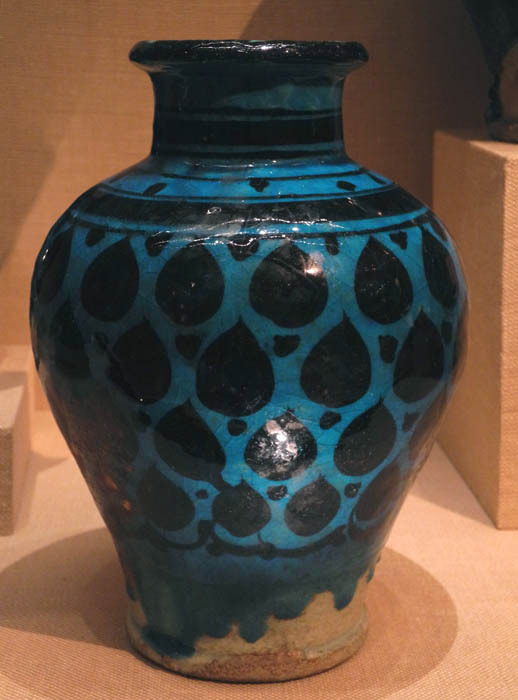 Jar; Syria, late 12th-early 13th century; stonepaste, underglaze painted under transparent turquoise glaze. The shape of this jar, from straight narrow neck into a wide shoulder and narrowing again at the base, has a sensuality asking for a flowing caress. But it's the color that heightens this feeling, the rich deep turquoise glowing like a jewel behind the black teardrops. 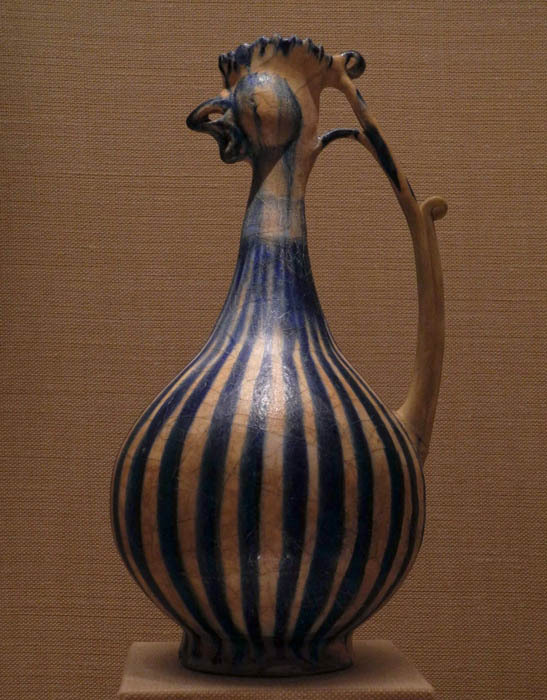 Rooster-headed Ewer; Iran, 13th century; stonepaste, molded and applied decoration, underglaze painted under transparent glaze. 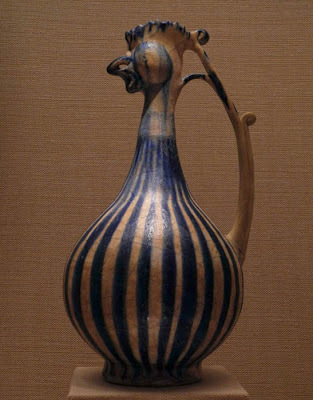 Topped by a open-mouthed rooster, a form popular in Islamic art, this vessel has great charm. It's bulging shape is emphasized by the pattern of cobalt blue lines, narrowing and widening. Turquoise bowl with Carved Rim; Iran, 12th century; stonepaste, monochrome glazed. The edge of this simple bowl is carved in a pattern that seems like the rising and falling of letters in Arabic calligraphy. 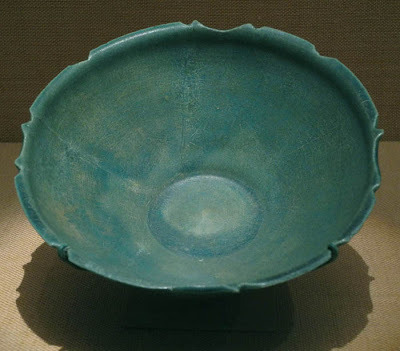 It is another of several turquoise colored objects that I fell in love with. I don't know if the color turquoise has any particular meaning in Islamic culture or if it was just prized for its beauty, but there was a a good deal of it in the objects in this new installation. 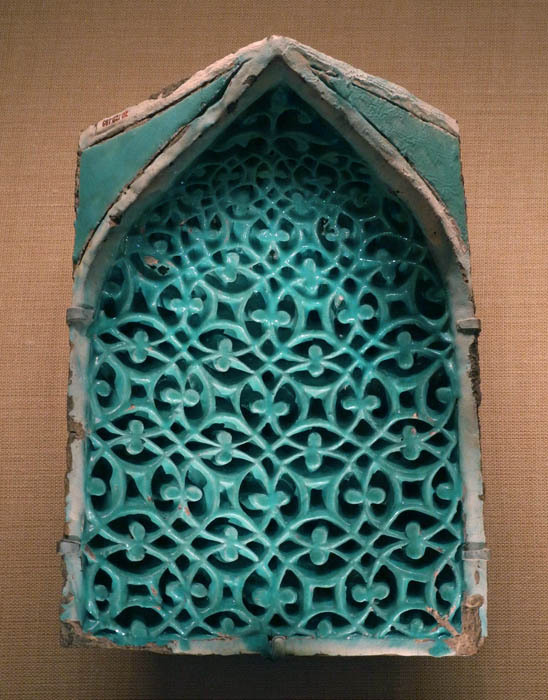 Architectural Tile with Partial Inscription; present day Uzbekistan, 14th century; stonepaste, carved and glazed. 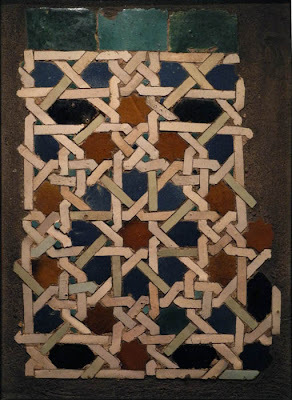 Tile from a Squinch; present day Uzbekistan, 14th century; stonepaste, carved and glazed. 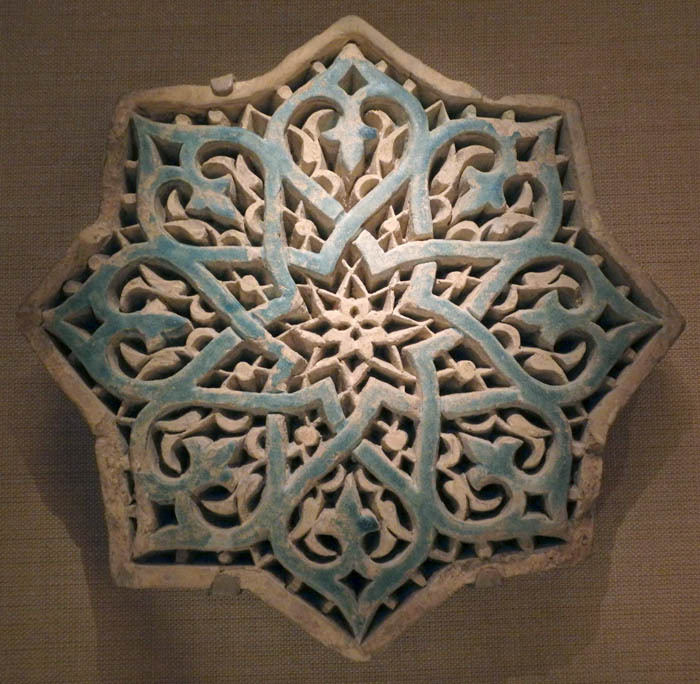 or from natural forms; here interlacing leaves or blossoms and vining branches decorate a deeply carved tile. If you were wondering what a squinch is, as I was, it's an architectural element forming a base for a dome. Ceramic Mosaic Panel; Spain, 14th century; earthenware, glazed. Sometimes the pattern comes from geometry, as in this complexly woven lines bending and moving in an almost impossible to follow way, leaving stars and other shapes in their wake. Carved Wall Tile; Iran, 13th century; stonepaste, carved and partially glazed. Finally, another beautiful architectural element, organized geometrically, inspired by the shapes of nature. The lovely sky blue lines curve and point as they join and flow over one another, arms entwined in a graceful circle dance. 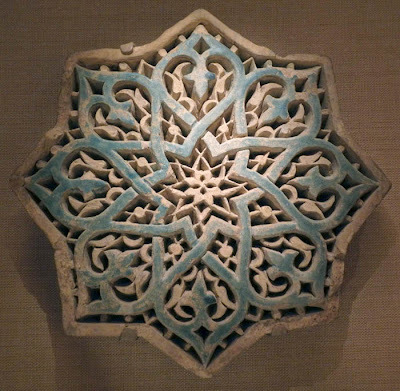 In his article in the NY Review of Books on the new wing at the Met, history professor Peter Brown points out the ideas on ornament of Islamic expert Professor Oleg Grabar: "Grabar showed that ornament was not trivial. It was never a mere mechanical patterning of the surface of things. Rather, he pointed out, ornament brings us back, with subliminal power, to the force of life itself." 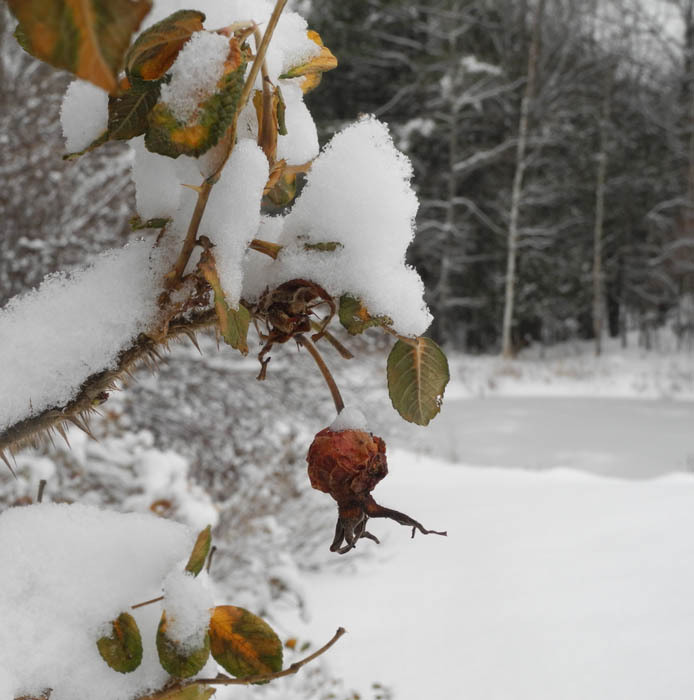 The snow began on Tuesday night and I woke up Wednesday to a world covered in white. It drifted down softly, in large and small flakes, throughout the morning. 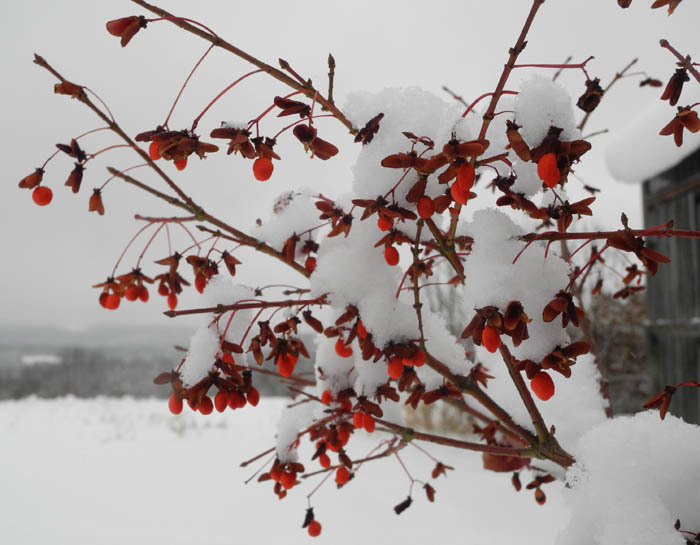 When I went outdoors to shovel a path, the air was cool but not frigid, the wind was still, the sky was covered with clouds, ten inches of snow had fallen; it was a beautiful day. 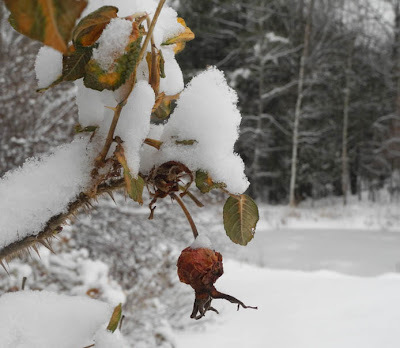 On Thanksgiving morning, snow still clung to every branch and remaining leaf, each dried fruit, their dark shapes creating a drama on a white stage. The stems of the honeysuckle vine by the front door are encased in a glistening gift package of ice. 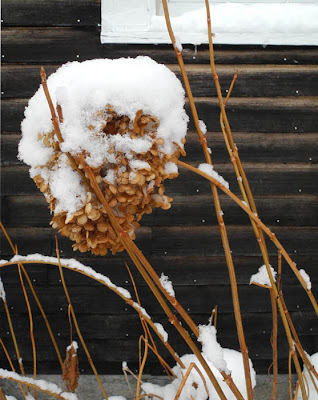 Annabelle, with her bronzed dried heads, bows to the weight of snow, her stems writing bright lines with weathered wood as backdrop. 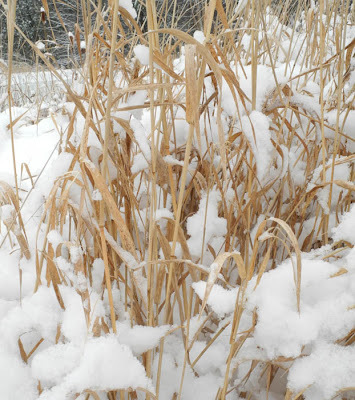 A more delicate profusion of gathered lines, interrupted by dollops of soft snow, is formed by dried grasses at the side of the pond. 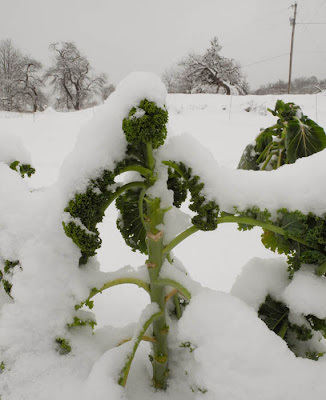 And in the vegetable garden, a few remaining leaves of kale, dressed for a ball with an elegant headdress of snow. 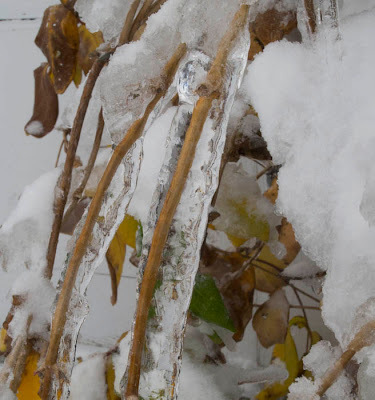 The garden season is over: I've taken down the fence and left these last bits for the deer to eat. 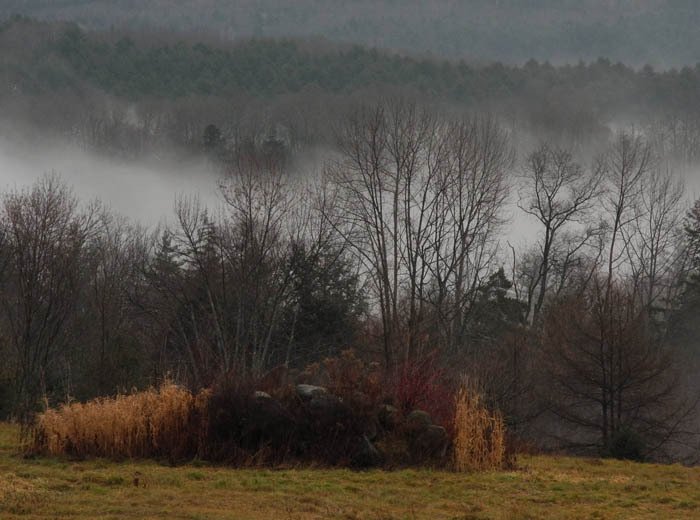 This morning, Friday, the tracks of several deer crisscross the field; stems are all that remain. 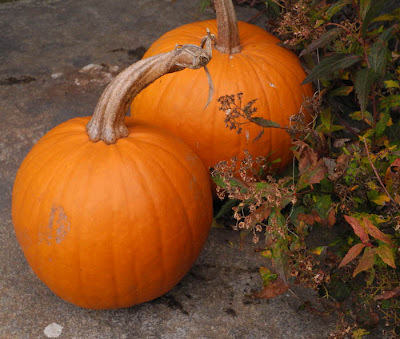 What vegetable is more associated with the fall harvest and the Thanksgiving holiday than the pumpkin? They were probably a New World crop, and may have been served at the first Thanksgiving. Now we generally use them for a delicious pie; they're also good stuffed and baked. 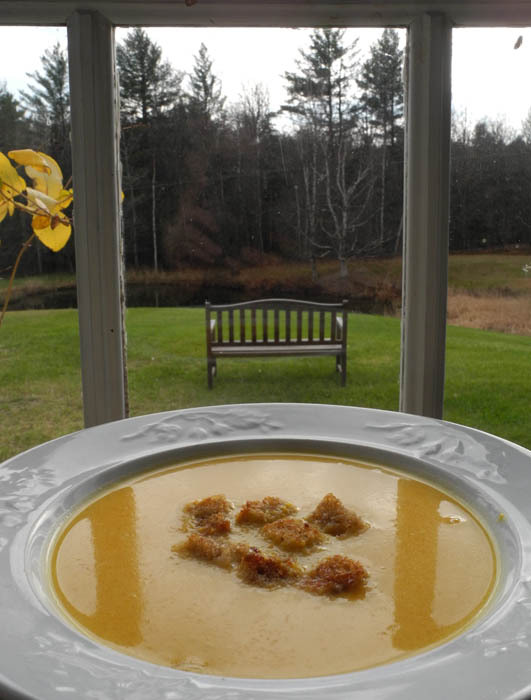 One of my favorite recipes with pumpkin is a soup, light and gently flavored, from The New York Times International Cookbook by Craig Claiborne. Eating it is a perfect way to celebrate the season; I send you, along with this recipe, my best wishes for a wonderful holiday with friends and family. Melt 4 tablespoons of the butter in a large saucepan; sauté the green onions and onion until golden. Add pumpkin, stock, and salt. Bring to a boil, then simmer until tender, or for 10 minutes if using the puree. Strain the soup, or blend in a food processor, or do what I do, which is simply mash the contents of the saucepan with a potato masher; I like some texture in the soup. Wall Painting of a Camel; Spain, first half of 12th century; fresco transferred to canvas. When I visit a museum with my camera, I am most drawn to photographing three dimensional objects; there is excitement in capturing something that exists in space, its volumes and shadows, and reducing it to the two dimensions of photography. But I did take photos of some of the marvelous two dimensional objects at the Cloisters, which I am showing you in this last post on the museum. I was most thrilled to see this fresco of the wonderfully goofy camel. 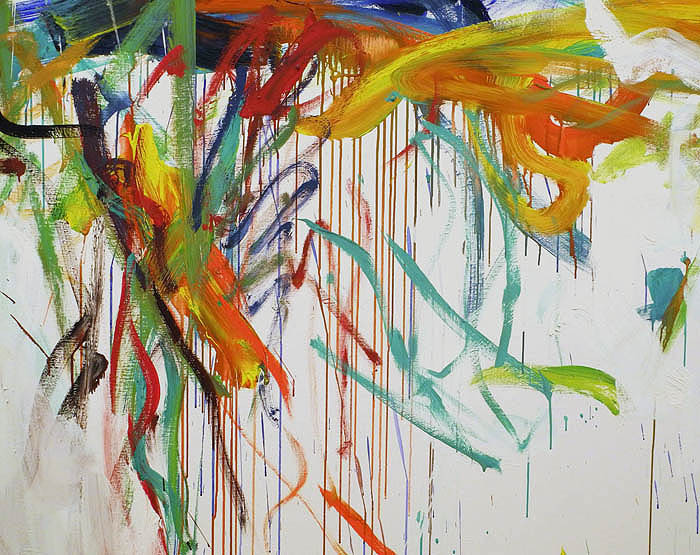 A postcard of it has been on my refrigerator for a couple of years (here's a blog post about the "paintings on my refrigerator") and I had no idea how big it was: it is 8 feet high, a strong presence in a large room. The Miracle of Christ Raising Lazarus from the Dead; Spain, ca. 1120-1140; fresco transferred to canvas. 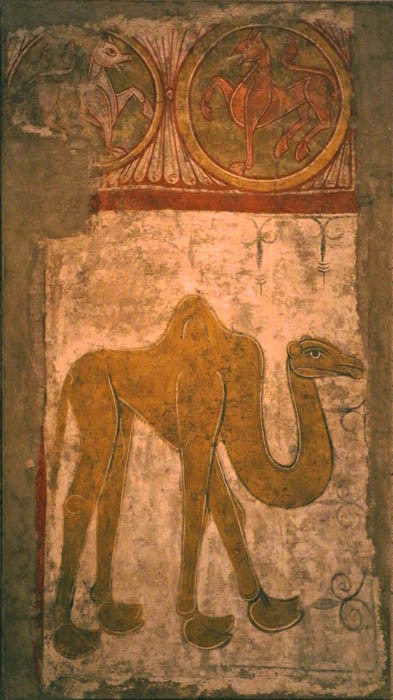 Near the camel are two other large frescoes from the same period. 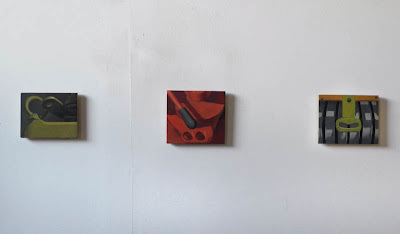 I love the flat, simplified forms, the limited color moving across the surface, the patterns of cloth and architecture, the intensity of the faces with their boldly outlined features. 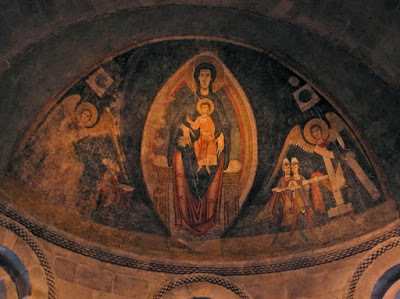 The Virgin and Child and the Adoration; Spain, ca. 1175-1200; fresco. 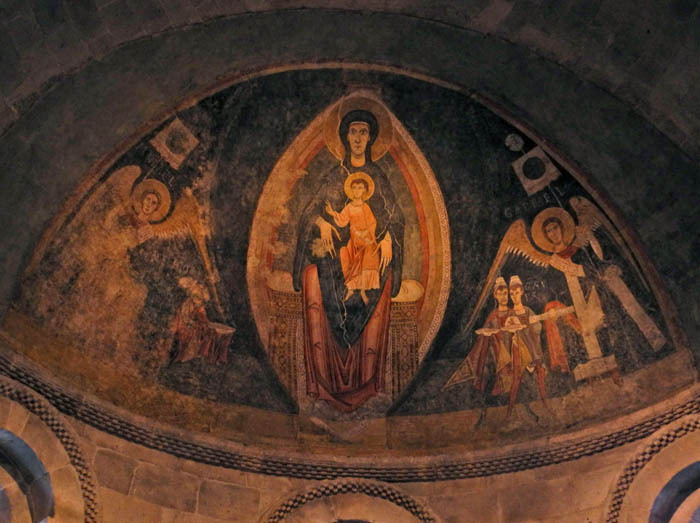 A slightly later fresco, also from Spain, has the same features that I love in the one above, with even more dramatic patterning around the enthroned Virgin and in the wings of the saints. Saint Michael (detail); Spain, ca. 1450-1500; tempera and oil with gold and silver leaf on wood. Saint Michael is skewering a fantastical creature named as the Anti-Christ in the wall label about the painting. It is reminiscent of the monsters of Hieronymus Bosch, who painted around the same time. 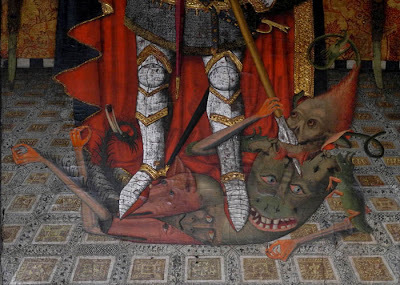 I love the profusion of detail: of his body, the floor tiles, the elegant armor of Saint Michael. Annunciation Triptych (Merode Altarpiece); workshop of Robert Campin, Netherlandish, ca. 1375-1444; oil on oak. From the Metropolitan Museum website. 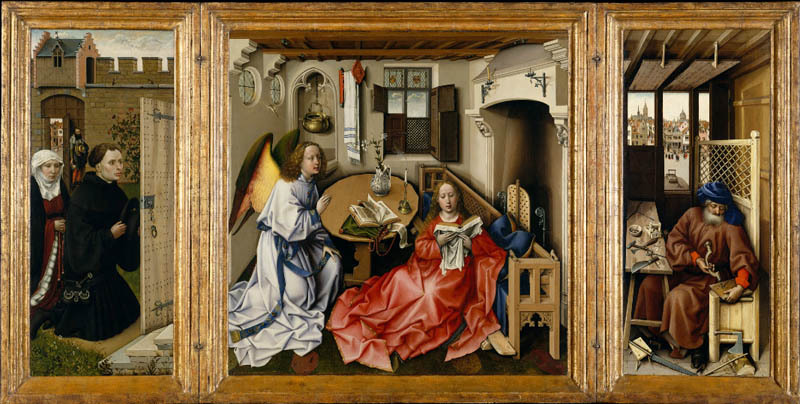 The Merode Altarpiece is one of the great treasures of the Cloisters. 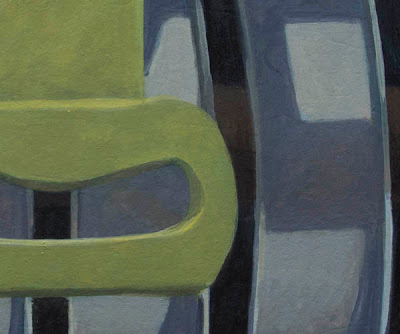 It is complex, yet intimate and tender; every detail, from faces to a key in a lock, is carefully rendered. In the left panel we move from its distant view out to the street into the grassy courtyard, then into the room with the Archangel and Virgin, and to Joseph's workshop where an open window gives us another view out onto the busy street. The website link under the photo above takes you to a wonderful high resolution image which enables you to look at all the fine details in this painting, including the tools on Joseph's workbench, down to the nails, along with slivers of wood left from his woodworking chore. 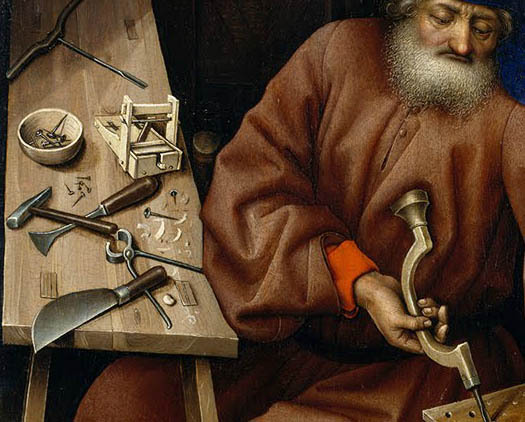 The painters who worked on this altarpiece were in love with the objects of this world. Two Border sections; France ca. 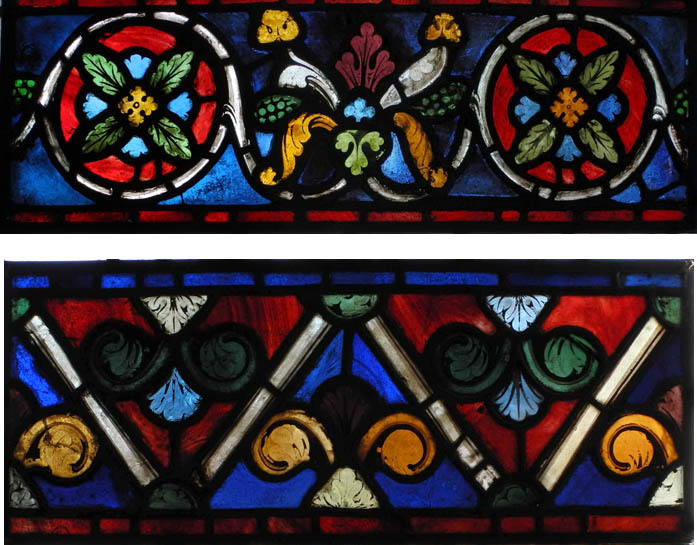 1200; pot-metal glass and vitreous paint. 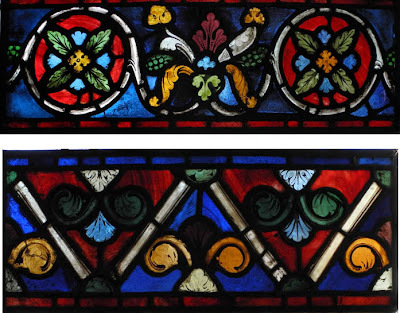 In addition to painting, other arts are represented in the Cloisters collections, including some vivid stained glass. 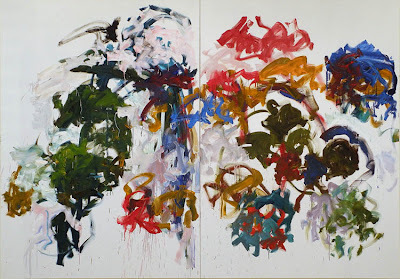 I was particularly interested in the patterned pieces that acted as borders to the main events; they look joyously colorful, and the repetitions, which are never exactly the same, add to the pleasure. 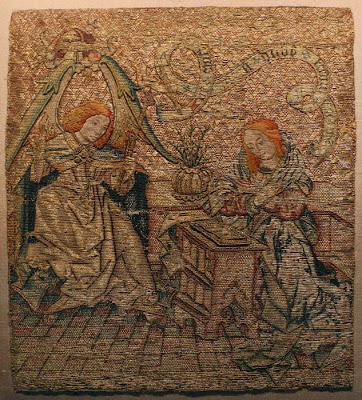 Embroidery with the Annunciation; South Lowlands, late 15th century; silk and metallic threads on linen. This very fine embroidery, only about 8 inches high, is delicately made and rich with silk and metallic threads. In its composition and form it is similar to paintings done at the time, but the physical presence and glitter of the richly stitched thread adds a different kind of charm. 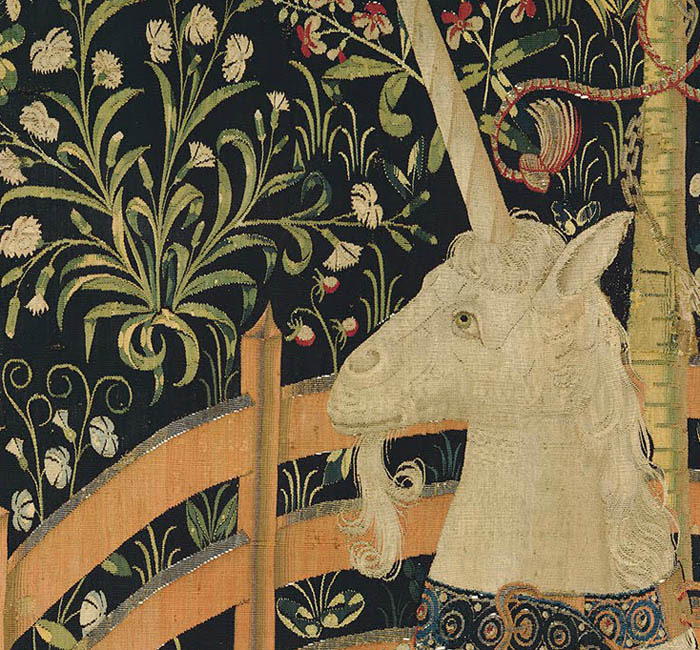 The Unicorn in Captivity (detail); South Netherlandish, 1495-1505; wool warp with wool, silk, silver, and gilt wefts. From the Metropolitan Museum website. The great cycle of Unicorn tapestries are a marvel, and you can see them all at the link above, in high resolution, so you can wander through them, entranced by the figures – all looking like specific portraits, clothed in elegantly patterned garments – and the sensitively rendered animals, and most wonderfully for me, the profusion of flowers and leaves and trees; a magical forest to house the mythical creature. Grin, egg tempera on calfskin parchment, 5 x 6 1/4 inches. The third and final painting in my series of handles is another amusing one (at least to me) and I couldn't resist calling it Grin for the curved opening ready for the grip of a hand. The straight horizontal at top is crossed by the green vertical, both pierced by holes, and backed by swelling gray bands broken by light and shadow. A little wacky? In this detail you can see the texture of paint and parchment; the fine indented lines are veining in the calfskin. 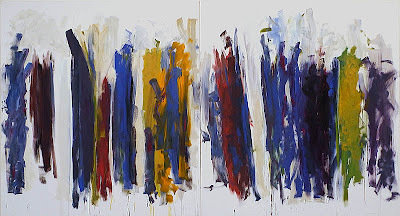 Beauvais 1986; oil on canvas diptych, 110 1/4 x 157 1/2 inches. I have loved Joan Mitchell's paintings for many years; twenty years ago when I tried my hand at a series of painterly abstractions, mainly based on landscape, Mitchell was a main influence, along with de Kooning and a soupçon of Howard Hodgkin. So I was very happy to be able to see the exhibition now at Cheim & Read in Chelsea of her late paintings; although these were difficult years for her, the paintings are full of extraordinary energy. Her marks – vigorously moving, paint dripping, thickly layered in places, open to the white of canvas in others – show the natural world in a splendor of color but with a fierce tenacity of purpose; yes it is beautiful, but it is not simple or easy. 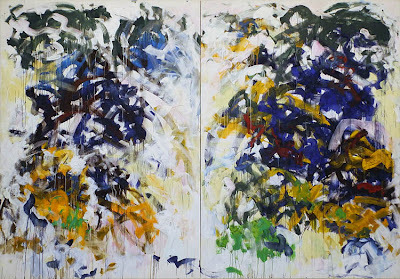 Untitled, 1992; oil on canvas diptych, 102 3/8 x 157 1/2 inches. 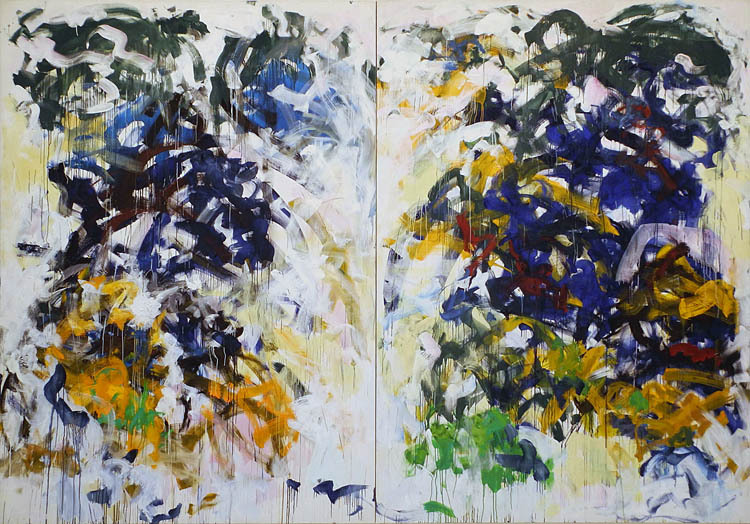 The diptych format, originally adopted to allow for large paintings in a small studio, allows for a conversation between the two parts of the painting, the same yet different; the hard line of separation makes us leap from one to the other of the two canvases, noticing more, repeating the quickness of the brushstroke with our eye. 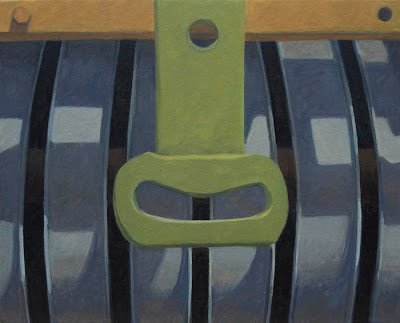 Seeing this detail, this seemingly casual welter of fast lines, makes me realize yet again that what seems easy is not. 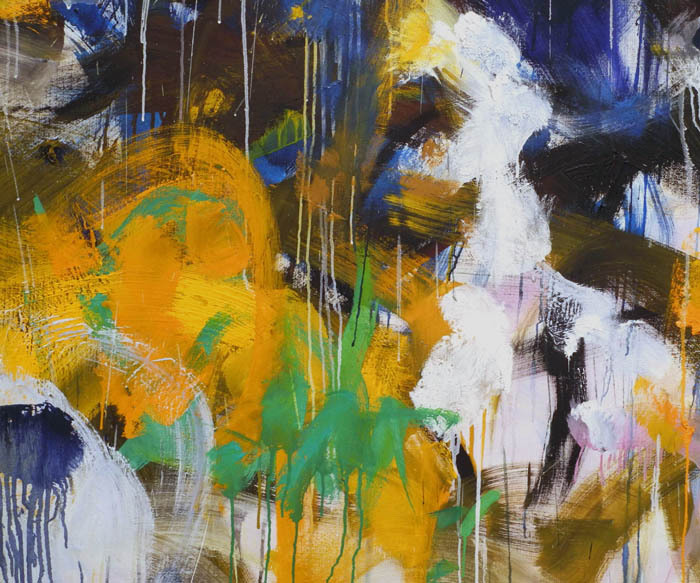 Like Japanese calligraphy with its free and fluid letters, what looks like innocently fresh painting comes from years of study. We have to know something deeply in order to have freedom. Tondo 1991; oil on canvas, 59 x 59 inches. Tondo, 59 x 59 inches. The tondo form compresses the gesture, pushing it inward, making a more self contained world. 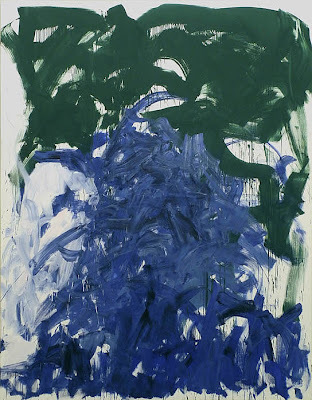 Then, Last Time IV 1985; oil on canvas 102 x 78 3/4 inches. A dense mass of churning blue strokes rises up to meet a watery green, like the reflection of trees in a turbulent pond. 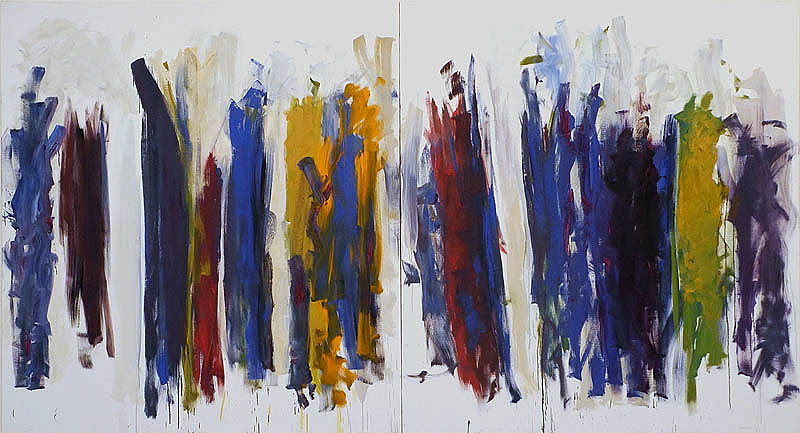 Trees 1990-91; oil on canvas diptych; 86 3/4 x 157 1/2 inches. 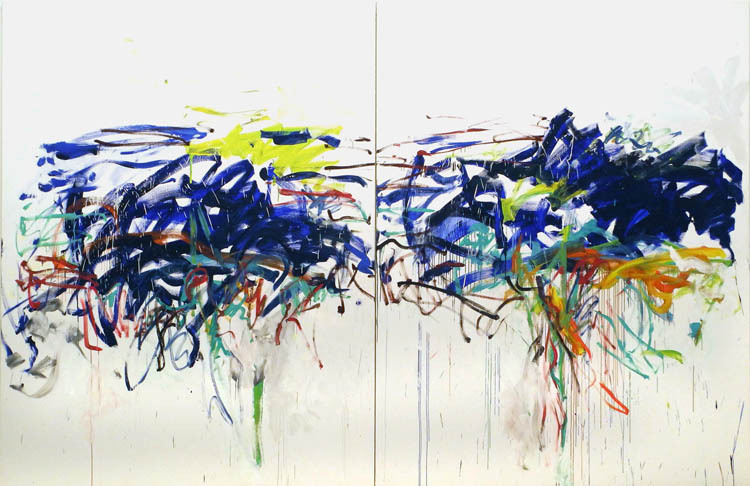 In Trees the brush moves vertically, a forest of marks creating the physical sensation of wandering between trunks, space fluid and uncertain, density giving way to openness. Sunflowers 1990-91; oil on canvas diptych, 110 1/4 x 157 1/2 inches. Sunflowers, symbols of light and life, explode with exuberance, not with the usual yellows but with red and green and brown, all caught together in a last exhalation of breath. 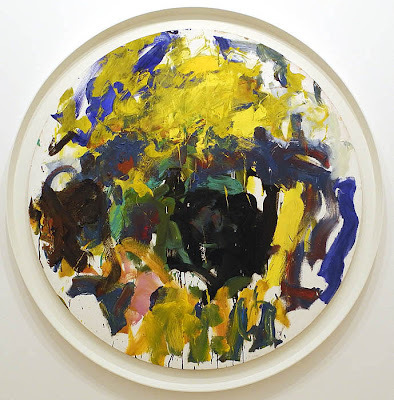 In the gallery press release Mitchell is quoted as saying that she wanted to “convey the feeling of a dying sunflower.” In this ode to life's transience resides a continuing belief in its beauty and strength. The brilliant colors of fall are gone and the fallen leaves spread over the ground have faded to subtle variations of brown: reddish and yellowish and in some places gray. I love the word "dun", for its description of a dull grayish brown, although even its present diminished state, there is enough variation in leaf litter to catch the eye. But this subtlety is overwhelmed by the intensely vivid greens scattered throughout the woods. This moss covered rock, shining out brightly from its surroundings almost as though it was lit from within, stopped me in my tracks during my walk yesterday. 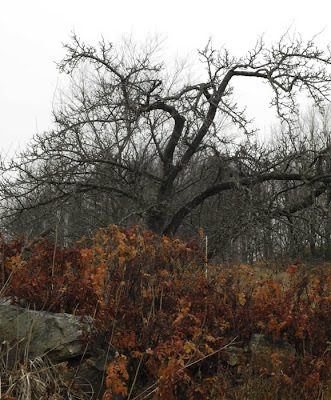 Then I began noticing other greens displayed against the browns: life, and its expiring. 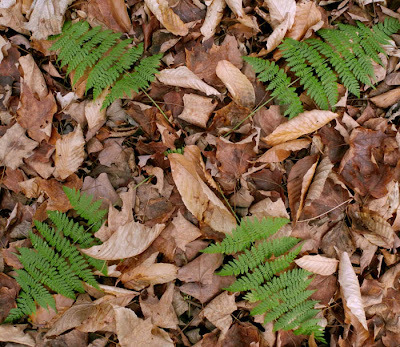 This fern's fronds point to the four directions, a neat geometry atop the random pattern of leaves. 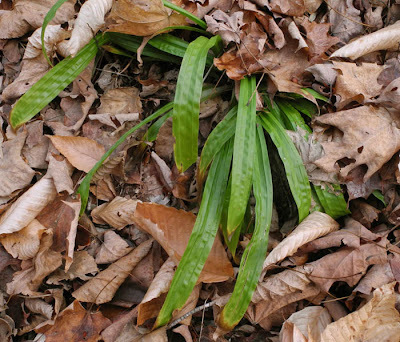 Although its leaves are beginning to brown at their tips, the plaintain-leaved sedge is still vibrant, arcing its corrugated green above the littered ground. 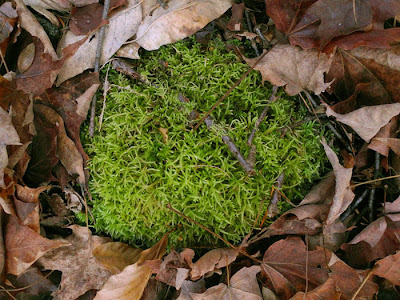 Soon all will be covered with snow, but for now it is heartening to see these still-green plants gracing the dun woods.